Transport, in its various modes as the means to travel, is not something I’d associate with popular music. I suppose you could argue Kraftwerk’s ‘Autobahn’ was written to remind the listener of the joys of driving on a motorway, and various sea shanties of yore recall simpler times, when all you worried about was pirates commandeering your seaworthy vessel full of rum. But I can’t say I’ve heard a whole album that uses transport as a metaphor for death, in the multiple senses of the word, nor do I think I’m likely to hear another one in my lifetime that uses transport as a theme as elegantly as in Teleman‘s debut album ‘Breakfast’. I know it’s early to be naming best albums of the year, but I’m pretty sure this one from Moshi Moshi Records is going to be my favourite of 2014. Three of the four members of the London via Reading band – singer/guitarist Tommy Sanders, his brother Jonny, now on keyboards, and bassist Peter Cattermoul – used to be in a wonderful band called Pete and the Pirates. A change in direction prompted the previous band to fold, and after shedding a couple bandmates and gaining a drummer in Hiro Amamiya, a new band called Teleman rose from the ashes. They’re not to be confused with the German baroque composer Telemann; when they first appeared on the scene, even BBC iPlayer got the two confused, much to my amusement. But even in their earliest revealed tinklings, one thing remained constant between the two bands: frontman Tommy Sanders’ voice, which remains one of my favourites in music today. Depending on the mood of the song, Sanders can sound as innocent as a choir boy, as sad as a child whose dog has just died or as petulant as a man who’s just learned his woman has cheated on him. Or a combination of all three. Pete and the Pirates fans will be pleased that Sanders’ voice is in usual excellent form. Sanders has said Bernard Butler was a good choice for producer, as he stepped in where he needed to and provided focus and let the band do their thing when songs were already good enough shape at demo stage, and the results speak for themselves. ‘Cristina’ was the first Teleman song to be released as a single, with the buzz of a synthesiser apparent from the start and throughout. The song details a clandestine love affair and falling in love with a girl from the wrong side of the tracks, as well as the physicality of actually needing to travel cross town to make this happen. While Sanders’ voice is angelic and the melody is pure pop, “I never meant to be the bad kid / the feeling came in uninvited” has him accepting the shame in what he’s doing, as do the lines “you remember you’re downtown / you really should be on your way now”, yet “some things take your right back / you forget you’ve got to go soon”, as if he can’t let go of a faded memory. Do you have fond recollections of Pete and the Pirates’ ‘Half Moon Street’, in which the protagonist has similar self-doubt and wistfulness about a past relationship? The same feelings are apparent in ‘Cristina’. ‘In Your Fur’, ‘Steam Train Girl’ and ‘Mainline’ all invoke thoughts of the railway, while the protagonist is trying to get over past flawed relationships, or rather flaws in his previous partners that he can now clearly see after the fact. The first two are faster in tempo pop songs and incredibly catchy but are biting lyrically. Humorously, Dutch airline KLM gets a mention in ‘Travel Song’. But it’s the one-two punch of current single ’23 Floors Up’ immediately followed by ‘Monday Morning’ that will truly get you in the heart and the stomach. While ’23 Floors Up’ involves a lift, or at least the idea of being taken up in one to a place miles up in the sky, these two songs are about non-mechanical movement: flying. The genius behind ’23 Floors Up’ is its use of a lilting melody: even with a borderline sinister drum beat throughout, it actually makes you feel like you’re floating when you’re listening to it. Tommy Sanders sings in the first chorus, “I’m leaving you behind, I don’t need anyone now / I’m leaving you behind, I can’t feel anything / oh, let me float on high / don’t need anyone now / I’m leaving you behind”. There is something so sad about this song, in which he describes the loneliness of a itinerant – businessman or rock star, perhaps? – on the 23rd floor of a non-descript hotel. I can’t decide if the voice is giving into thoughts of suicide (hence the idea of floating upwards, towards heaven) and he’s feeling numb (“so slowly spinning round / I can’t feel anything now / oh love is pouring down”) or he’s trying to evade the world by being in this room in the sky where nothing can touch him and the thoughts of the woman he loves are keeping him alive (“carry it on, the wood pigeon’s song / sits on the wire and tells me nothing’s wrong / hey, sing to me your song”). Either way, it’s a tune sweeping in its fragile beauty that deserves your undivided attention. In contrast, album standout ‘Monday Morning’ is a sweet if heartbreaking story about a man who insists he knows the woman who broke up with him is still in love with him, even though she has found another (drifting through the night / whatever you’re thinking of me / you’re probably right / if you are so smart / surely you can see / whoever you’re waking up with now / you still want me”). It’s a fatalistic yet far more elegant version of the Script‘s ‘Long Gone and Moved On’, as he says to her, “I fell asleep with the radio on / I started dreaming / you were in every song”; she’s still haunting his thoughts even when he’s not awake. It’s no mistake that the song begins with a synth note beeping on repeat: it’s supposed to represent singularity, as are the inanimate blips that connect the verses that recall OMD‘s more sensitive moments. The more I think about it, ‘Monday Morning’, along with the album’s title ‘Breakfast’, must have been chosen for their relative locations in time to indicate new beginnings, of the start of a week and the start of one’s day, respectively. Rather than signal a complete change of heart, the songs on this debut album from Teleman exhibit varying stages of a work in progress, the admirable attempt to move on from a toxic relationship. The moment when when you go back to feeling good about yourself and when you get there is not important. Knowing that the day will come is reward enough. ‘Breakfast’ is a gorgeous collection of songs fuelled by such emotions, appealing to those seeking evocative lyrics of love lost and those in the mood for memorable melodies alike. 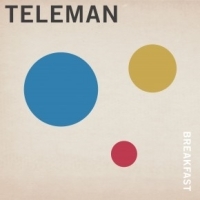 ‘Breakfast’, the debut album from Teleman, is out Monday (the 2nd of June) on Moshi Moshi Records. My favourite new band, and fantastic live.